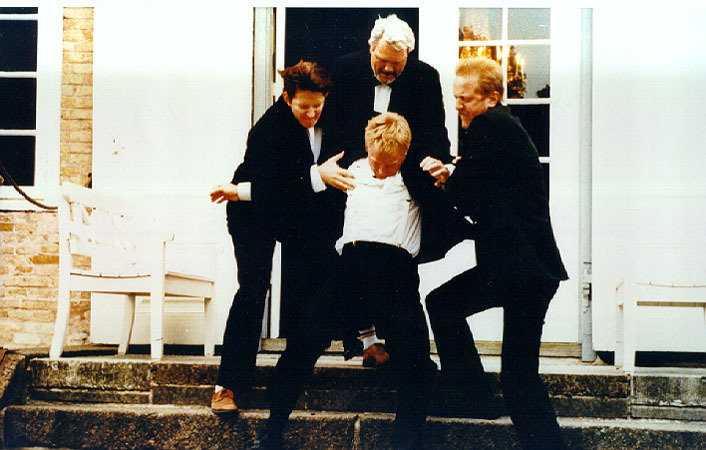 The first film to be made under the constraints of the Dogme 95 manifesto, a back-to-basics anti-Hollywood statement, Festen certainly hasn’t dated. Watching it again I was struck by the tragic-comedic elements; the guests’ drunken and senile behaviour as well as the slapstick of the chasing around. I guess, the first time, I was being overwhelmed by Christian’s revelations. To what extent is it criticising the bourgeoisie, with their complacent reliance upon manners, or is specifically about Danish ceremonial tradition is not clear. It doesn’t matter; the representation of the absurd bourgeoisie is comparable with Bunuel. The handheld camerawork is terrific throughout, the often angular compositions express the cataclysms the family are experiencing. However the film – a la Dogme – doesn’t eschew genre, it is melodrama to its core and certainly none the worst for that.